Poke this image to see a different color 'palette'. Poke off of the image to change back. first-time releases of subsystems, and at releases of new versions. links to their detailed DESCRIPTION pages. The FE system is basically sets of shell and Tcl-Tk scripts which are being released in stages --- by utility or groups of utilities. 'feNautilusScripts' - a set of more than 450 handy Gnome2-Nautilus (or MATE-Caja) shell scripts. 'xpg' - a unique, powerful text browsing utility, written using Tcl-Tk for the GUI. 'xpg' (ex-pee-gee or ex-page) implements a SAM (Show All Match-lines) 'extract' capability --- a saver-of-precious-time. 'feAppMenus' - a unique application menus system, written using Tcl-Tk to make the 'toolchest' GUIs. 'feAppMenus' is extremely tailor-able by the user. 'tkGooies' - a menu system of Tk script utilities, in toolchests like the toolchests generated in the 'feAppMenus' system, and with categories of utilities and scripts similar to those in 'feNautilusScripts'. However, in 'feNautilusScripts', when several parameters are needed in a utility, the user is prompted with a sequence of 'zenity' (dialog GUI) prompts. Here is a web page that provides a DESCRIPTION of the 20-plus categories of FE Nautilus shell scripts --- along with links to pages of CODE samples of the more than 450 shell scripts. See the images of the cascading 'feNautilusScripts' menus on that 'Description and CODE Samples' page --- and on the categories (sub-menus) pages. That web page gives an overview of the organization (grouping or categories) of the 'FE Nautilus scripts' and provides links to category pages (about 10-plus categories) that show the code of many of the scripts. Check out the comments in the scripts to see details on how to use the scripts. For those Linux users who do not use the Gnome2 desktop environment --- for example, users of Xfce or LXDE desktop environments --- I have put together a web page on installing and tailoring the Nautilus File Manager for non-Gnome desktops. That web page provides a way that Linux users who do not use Gnome2-and-Nautilus (nor MATE-and-Caja) can use the utilities in 'feNautilusScripts'. Another approach --- that avoids the use of Nautilus altogether --- is to use a pair of Tk GUI's (dubbed 'tkScriptApplicator') --- available in the FE 'tkGooies' system. The 'xpg' utility is a text-file browser utility that does NOT open the text file in 'update' mode (like a text editor does). Hence you do not have to be concerned about accidentally changing the file that you are browsing. The 'xpg' utility includes a powerful capability: For a given search string, 'xpg' can extract ALL the matching lines and show them in another instance of the 'xpg' GUI --- AND you can choose to show the lines plus or minus N lines around the match lines. I call this feature the 'Show-All-Matches' capability --- SAM for short. The 'xpg' utility is described on this detailed-DESCRIPTION page for the 'xpg' text-file browser utility. See the images of 'xpg' on that page --- both in its default mode and in its expanded 'Other' options mode. See 'xpg' in blue instead of gray. In other words, you can change the color-scheme of the 'xpg' GUI --- and the font used in the scrollable text area. See images of the 'FE Color Selector' GUI and the 'FE Font Selector' GUI. A nice color viewer-selector GUI utility and a font viewer-selector GUI utility come along as part of the 'xpg' subsystem. Here is a web page that provides a detailed DESCRIPTION of the 'FE App Menus' subsystem. See the images of various 'feAppMenus' toolchests on that page. And see examples of menus in different colors and with different fonts. The center-piece of the 'feAppMenus' system is a 'make_chest.tk' Tk script that makes all the 'toolchests' from '.chestdef' files, which have a very simple plain-text format. and the user can even change the 'make_chest.tk' script to make the chests in a quite different way (with different Tk widgets, 'canvas' widgets instead of 'button' widgets, for example). Here is a link to a DESCRIPTION and Code Samples web page for FE 'tkGooies'. See the many images of (1) toolchests and (2) Tcl-Tk prompting GUI's via that page. Like the 'feAppMenus' system, the FE 'tkGooies' system uses a 'make_chest.tk' Tk script that makes all the 'toolchests' from '.chestdef' files. The '.chestdef' files have a very simple plain-text format. and the user can even change the 'make_chest.tk' script to make the chests in a quite different way (with Tk 'canvas' widgets, instead of 'button' widgets, for example). In a future release of 'tkGooies', the user may be offered several versions of the 'make_chest.tk' script --- by which the user can decorate the background of the 'drawers' or the entire toolchest background, with images of the user's choice. At the bottom of the FE Contact page, in mid-2011, I expressed concern about whether the 'Nautilus Scripts' capability would be able to weather the storms created by Gnome 3 and Ubuntu Unity developers, as they throw out more babies than bath water, and as they seem to show no love or appreciation for the 'Nautilus Scripts' capabilty. I later announced at the bottom of that page that I had devised a 'fallback' solution, in the 'feHandyTools' system, so that I would be able to run the 'feNautilusScripts' even if the 'Nautilus Scripts' capability dies an ugly death at the hands of Gnome3 and Ubuntu developers. Since a picture (or screenshots) is worth a thousand words, I offered this How to run Nautilus scripts in 'feHandyTools' page. With the release of the FE 'tkGooies' system, an improved version of the script-applicator utility --- called 'tkScriptApplicator' --- is available in a 'FILEmanagers' toolchest. The 'feHandyTools' subsystem is deprecated --- that is, it is being replaced by the 'tkGooies' subsystem. Development hours will be devoted to 'tkGooies' rather than to 'feHandyTools'. So the 'tkScriptApplicator' in 'tkGooies' is my ace-in-the-hole, in case the 'Nautilus Scripts' capability disappears from the MATE-Caja desktop system that was forked from Gnome2-Nautilus. The 'tkScriptApplicator' capability allows people to take advantage of the 450-plus 'feNautilusScripts', even if they are not users of the Gnome2-Nautilus file manager or the MATE-Caja file manager. The 'xlphp' utility could provide an alternative to using the CUPS or HPLIP systems for printing text files --- like scripts, program code, configuration files, log files, etc. The open, all-scripts nature of the 'xlphp' utility would allow for making it do what you want it to do. It is not feasible for most users to change the CUPS or HPLIP monolithic, compiled-language, complex-code systems. I have had problems with 'filters' in those systems not allowing me to print out some pretty simple, plain-text files --- like Tk scripts, for example. I will not have those 'overly aggressive filter' problems with my 'xlphp' system --- IF I can circumvent the way CUPS and HPLIP dominate the 'lpr' and 'lp' print spooling systems --- without de-activating the CUPS or HPLIP systems. I also want to be able to handle printers directly connected to a computer via a USB port --- rather than just network-attached printers, attached via print-server boxes/cards attached to the printers and an ethernet connection to the computer via an ethernet switch. I have hit a stumbling block in getting the 'lpr' print system to recognize direct-USB-attached printers --- via 'lpr' print system commands. Anyone having information on how to get the 'lpr' daemon to recognize such an attachment, please contact me. 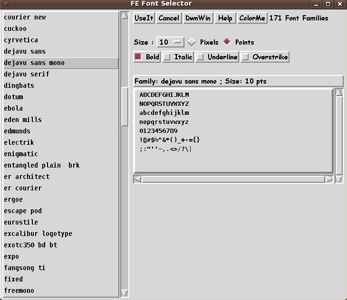 'feAppMenus', 'feColorSelector', 'feFontSelector', 'xpg', and 'feHandyTools'. FE Software . . . . getting Better, Faster, Stronger. Bottom of the FE System OVERVIEW page. Page was created 2010 Aug 22. Page was changed 2015 Oct 16. Page was changed 2018 Aug 06. Page was changed 2019 Feb 28.